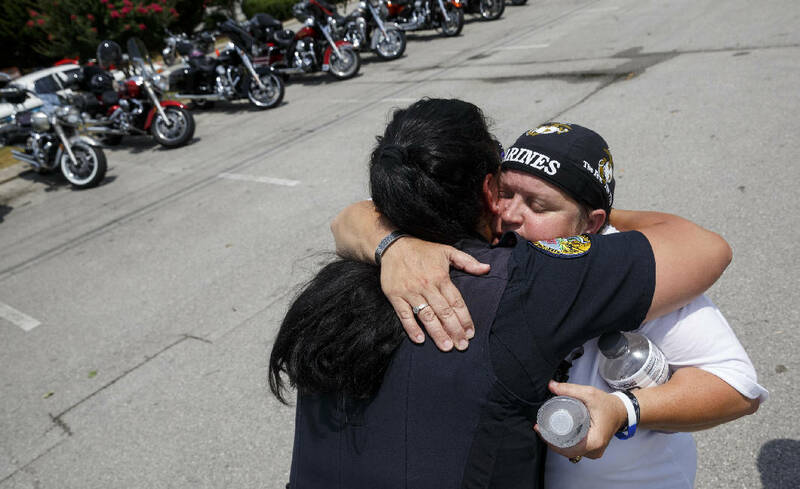 Cathy Wells, mother of Skip Wells, right, hugs Chattanooga Police Officer Christina Henderson at Thunder Creek Harley Davidson after a motorcycle ride from Atlanta to Chattanooga to honor the memory of Skip on Saturday, July 9, 2016, in Chattanooga, Tenn.
At the edge of the Sprayberry High School football field, in the swell of teenage tears and American flags and existential questions, a man stepped forward to salvage this whole mess. He came to greet a group of parents, waiting to meet him in person for the first time. They knew him online, on private Facebook pages for families and supporters of the U.S. Marine Corps. They heard of his bonafides. John Shannon Simpson was a 20-year veteran of the Corps. A retired master sergeant. Reconnaissance Marine. Former Parris Island drill instructor. The group also knew Simpson came here with a purpose. They knew Cathy Wells, mother of Lance Cpl. Squire "Skip" Wells, one of the five military servicemen who died in Chattanooga on July 16, also greeted him that evening, before a memorial for her son at his alma mater. It had been five days since his death. Through a Google search, Cathy Wells' sister had found Simpson's charity, Marines & Mickey. Simpson said he raised money to ship Marines and their families to Disney theme parks, providing them with stress relief after months of protecting the country. There wasn't a more perfect way for Cathy Wells to honor her son. Every summer, from the time he was 3 years old, Skip and Cathy Wells went to Disney World. They returned from their final trip eight days before he died. On that trip, for the first time, Skip Wells paid their way. To Cathy Wells, Simpson represented hope. He was a decorated Marine with a heart for helping. In the storm of sorrow, as she searched for meaning, Simpson was a lighthouse. That night, after the memorial, after police escorted Cathy Wells away, Simpson greeted a group of Marine parents and supporters. They had posted online about coming to the memorial, about getting to know each other in real life. Among the group, Simpson was the grizzled veteran with all the answers. But in person, his appearance was a bit surprising. He was short and baby-faced. Still, his handshake was pure confidence. "If anybody stepped to any of us wrong, they would be done for," said Dina Johnson, who met Simpson that night. "He would take them out. He was a Recon Marine. He was a drill instructor. He was a bad a**." But while Cathy Wells, Johnson and others were impressed by Simpson that night, another group of parents throughout the country expressed concerns online about the Recon Marine and his charity. They said he stole from their sons and daughters. They said he refused to prove how he used his donations. Interviews with Simpson's childhood friends, neighbors, family members, former co-workers and customers reveal a man who has hurtled himself toward success, overcoming a wave of setbacks. From a humble background, Simpson worked his way toward nice houses in nice neighborhoods, though his path is lined with civil lawsuits, arrests and accusations of fraud from customers and co-workers. Critics believe he is a con artist, though his victims' pockets don't run deep. "I met the Bernie Madoff of the poor-to-working class," said Theresa Bass, who once volunteered at a fundraiser with him. Simpson, on the other hand, said he has been unfairly targeted by a group out for blood, just for sport. The parents of Marines are often lazy, he said, the type of people who don't want to work for anything — the type of people who force their children to live in low-income neighborhoods. That's why so many people enlist in the Marines: To get away from home. "It's just the class of people they are," he said of his accusers. "These people will always gossip about something. They have such a sorry life. They need to talk about something. Right now, they're attached to the foundation." Last year, friends say, Cathy Wells helped Simpson raise $160,000, unaware of the questions littering his background. Meanwhile, a collection of Marine parents tracked their friendship on Facebook. The group felt torn. They wondered if Simpson would use his alliance with Cathy Wells to build his bank account, though some said they believed Simpson would not be so bold as to disrespect the mother of a fallen Marine, especially not one with such a high profile. Also, they thought they needed to keep something secret. They didn't want Simpson to know the feds were investigating him. John Simpson showed promise as a child, said his father, John C. Simpson. Neighbors on his Belton, S.C., block recognized his quick wit. But he wasn't motivated. John C. Simpson said he tried to convince him to study in high school, to no avail. He always passed his tests, his father said, but he could have done better. "He'll do the least as possible, as long as he can get away with it," said one neighbor, Jeff Stutler. "He's head-smart. That's how he's always been." The Simpsons lived on Cox Street, a stretch of small frame houses built decades earlier for the mill workers who once populated the town. Depending on who you ask, the street was either holding on to past success or had slipped into a poor community by the 1970s and '80s, when John Simpson was growing up. His father worked as a maintenance technician at an aluminum manufacturing plant while his mother, Cathy Simpson, was a teacher and a school bus driver. She was popular in the community, especially among children. Stutler, who later married and divorced John Simpson's sister, said the Simpsons were seen as the elite family in the neighborhood. They had a hot tub and a camper, and Stutler said they bought their clothes at the mall. He said Cathy Simpson never let other children in her house, creating a sense of mystery among them about what must be inside. John Simpson said he decided in the eighth grade that he would become a Marine. He was athletic and tough, and he liked basketball and football. But he was too small to earn a sports scholarship, only growing to 5 feet, 9 inches. The Marines would be the right fit for a man of his temperament. He enlisted days after graduating high school and began his service in July 1994, according to the U.S. Marine Corps. Manpower and Reserve Affairs Department. He served as a financial technician. He was still in the Corps two years later, when a former childhood friend said Simpson made a surprise appearance at a group outing at the beach. The friend, who spoke on the condition of anonymity because he said John Simpson has threatened to sue him for criticizing him online, said John Simpson explained to everybody that he was allowed to return to South Carolina because of an injury. The group didn't think anything odd of that. But about one year later, in June 1997, an Oconee County, S.C., sheriff's deputy arrested John Simpson on charges of driving with a suspended license and unlawful possession of a pistol. According to a local newspaper, someone called the police to report John Simpson's vehicle as suspicious after he knocked on doors to solicit money for the fire department. The sheriff's deputy entered John Simpson's name into a national database and found that the Armed Forces were looking for him, according to an incident report. A spokeswoman for the Manpower and Reserve Affairs Department could not go into specific detail about what happened next, but John Simpson went before a court martial and was involuntarily discharged in August 1997, two months after his arrest. The spokeswoman said he was discharged as a private, the lowest rank possible. John Simpson said the police incident report isn't accurate. He said he was home on leave when arrested, not wanted by the Armed Forces. He said he spent 15 days in jail, and that's when the Marine Corps reported him for an unauthorized absence. John C. Simpson said his son came home from the Marines and scraped through a couple of odd jobs, first at a heating and air company, then at a jewelry store in the mall. Meanwhile, in 1999, Anderson County judges convicted him of signing fraudulent checks six times in a one-month span. He said he later paid the money back. In November 2004, John C. Simpson was driving Cathy and some grandchildren near Belton when he fell asleep at the wheel, a court filing shows. He believes he was knocked unconscious by carbon monoxide somehow entering his car. He crossed the center line, crashing into several other vehicles traveling the opposite direction. The grandchildren were injured. Cathy died. As the representative for his mother's estate, John Simpson sued his father for wrongful death. The two sides settled without a trial, and John C. Simpson's insurance company agreed to pay $45,000. Father and son remain on good terms. John Simpson said he sued John C. Simpson so his father's insurance company would pay for medical bills for two of the children in the car crash. And that is true; those lawsuits exist. But there is another lawsuit in the Anderson County, S.C., courthouse that does not mention the children. It says John Simpson sued as the administrator of his mother's estate, claiming his father was liable under the Wrongful Death Act. John Simpson said the lawsuit never happened. "That's ludicrous. No. I've never sued my father. That's crazy. That would send someone to hell." In 2005, John Simpson launched Simpson Security in Anderson, S.C., a city next to Belton. Soon after, his customers expressed concerns about their purchases. According to the local Better Business Bureau, 33 people filed complaints against Simpson Security. Fourteen people also sued the company, court records show. Some said employees installed systems incorrectly. Others said employees never installed them at all. Around that same time, John Simpson became active with local veterans. Kit Sanders, the president of Teufelshunde MC, a small, Marines-only biker bar in Anderson, walked into his club one day to find John Simpson on the couch with two members. Under a canopy of camouflage netting, surrounded by American flags and Confederate flags and old photos of the members in their uniforms, Sanders listened to John Simpson tell stories about missions in Iraq and Afghanistan. He also talked about being a Parris Island drill instructor. Several times, Sanders said, John Simpson told the men in the bar about working as a Recon Marine. Sanders didn't believe John Simpson was telling the truth. His stories about what Iraq looked and felt like didn't match what Sanders heard from other veterans. Plus, Recon Marines don't tend to brag about their status, at least not as soon as they meet people. They carry themselves with quiet confidence. Recon Marines are the most elite members of the Marines, on par with Navy Seals and Green Berets. Many go through special training to parachute from planes, dive underwater and survive alone in the wild. They specialize in covert intelligence gathering and help shape the battlefield for operations in unknown lands. David Daniel, president of the Marine Reconnaissance Foundation, said the extra training to become a Recon usually takes about five years. At the bar, Sanders said he told John Simpson to leave. Sanders wanted to fight him, but John Simpson had recently hired two members of the bar to work for his security company. John Simpson also began helping local Marine recruiters. Blake Grice, who owns a gym in Anderson where John Simpson and his wife trained, said John Simpson brought poolees to the gym. Poolees are recruits who have joined the Marines but are still waiting for boot camp. To help them prepare for the grueling 13 weeks of training that lie ahead, Grice said, John Simpson told the teenagers to work out while he yelled at them. He told them about his time as a Recon Marine. The title made him seem like a hero. "You want to be a Recon?" Grice recalls John Simpson yelling at some poolees while they did pushups. "What's up, Recon!" he hollered, mockingly, at those who struggled during the training. Grice and John Simpson became friends around 2009. They hiked and camped on stretches of the Appalachian Trail. They went to the movies. Their children played together in the Simpsons' big backyard in a nice part of town. But Grice quickly began to believe John Simpson was lying about his military credentials. Grice, who said he graduated from the Citadel and spent six years in the Army Reserves, said John Simpson almost always talked about his time in the Corps. He was so "sickly obsessed," Grice said, that he wouldn't see a war movie unless it focused on the Marines. The other branches were always taking glory when the Marines did the real work, it seemed. But in John Simpson's house, Grice said, the only evidence of his time in the service were pictures of him at boot camp. And he said John Simpson talked in detail about going through Basic Underwater Demolition/SEAL training, though that is for Navy Seals, not Marines. John Simpson also boasted a tattoo on his forearm of the Jack of All Trades, a symbol for Recon Marines. It shows wings, a diver, a parachute, a knife and a skull. Permanent marking or not, Grice said John Simpson did not look like a Recon Marine. "He was short, overweight and out of shape," Grice said. "He did not have the presence of an elite commando." Even so, Grice maintained a friendship with him: "He was always telling jokes. He was fun to be around, if you didn't know he was lying about everything he said to you." Then, one day in 2013, John Simpson and his family disappeared. Court filings show they stopped making payments on their house in November 2012 with about $150,000 left on the mortgage, and the landlord for his company's office said he owed $28,000. Grice received a letter from Nichols Security, a company that purchased the contracts for Simpson Security for somewhere between $100,000-$200,000. Grice had been paying John Simpson to monitor his gym for two years. When an employee for Nichols Security showed up to the gym, Grice said, he found out the building had never actually been monitored. While John Simpson said the purchase of his company's 5,000 contracts shows how successful he was, Nichols Security Operating Partner Patrick Massey said that's not true. Simpson Security only had 200 contracts. And of those, some of them were like Grice's — never being monitored, despite payments to the company. Grice and John Simpson remained friends on Facebook, where John Simpson continued to write about his military career. One day, Grice said, John Simpson changed his profile picture to an image of Afghanistan combat ribbons. Grice believed John Simpson was implying he earned those awards. That made Grice even angrier. Then, at the beginning of this year, Grice said John Simpson posted a picture with the caption, "F*** Fallujah." He said someone commented: "Thank you for what you did for this country." That sent Grice over the edge. After selling the security company, John Simpson said he and his wife wanted to retire to Florida. They found a spot in Estero, a city in the southwest part of the state. John Simpson launched two new companies: Semper Fi Security, and a pool cleaning service called A Few Good Men. He also began training poolees again. Joel Slaymaker, a Marine recruiter, said John Simpson showed up at the office and told him about his military history. Slaymaker introduced him to some teenagers bound for boot camp. He yelled at them in convincing fashion. In June 2014, Slaymaker brought John Simpson to the Fort Myers, Fla., home of Maria Maldonado, whose 12-year-old son, Ethan, suffered from a rare and terminal form of brain cancer. Ethan had dreamed of one day enlisting in the Corps, and a Marine Corps commandant named him an honorary Marine. His story became popular in the military community. In the last weeks of Ethan's life, John Simpson began to make appearances. One day, he dropped off a book for Ethan. The two posed for a picture. Another day, John Simpson helped Ethan apply a stick-on tattoo of the Recon Marines' Jack of All Trades symbol. They took another picture together. When Ethan died, at the request of Maldonado, Simpson prepared a Marine uniform for Ethan to wear in his casket, pinning ribbons to the boy's dress blues. John Simpson also launched a GoFundMe account for Maldonado, who wanted to start a charity in her son's honor. She said the account raised $6,400. She said she only received about $550. John Simpson told her his team needed to keep 40 percent of the money for all the work they did running the Go Fund Me account. They were going to put the money toward their own new charity, Marines & Mickey. Still grieving, Maldonado said she asked John Simpson for the other 60 percent of the money. John Simpson said he paid her. Maldonado said he didn't. Eventually, fighting him was too much work. "I never understood why people complained about free money," John Simpson said. "She got thousands of dollars." "Some people are born innately bad," Maldonado said. "And I think he's one of them — the proverbial bad seed." That same summer, John Simpson became active on social media, promoting his new charity. He said he came up with the idea when he brought a couple Marine friends to a Disney theme park. He thought to himself, "All Marines should experience a place like this." He also said his charity would send families to Marine boot camp graduations if they couldn't afford it. Lynn Hayes read a post by John Simpson online and decided to promote his cause. Hayes, whose son is a Parris Island drill instructor, serves as an administrator for several private social media groups dedicated to families of Marines in training. The pages build a community for parents who don't know much about the military, who want to understand what their children are experiencing during their 13 weeks of training. Each page is dedicated to one company, though experienced parents like Hayes also join to provide information. That's how she met Renee Dixon, whose daughter was graduating from boot camp in Parris Island in June 2014. Dixon had just been diagnosed with lupus, and she and her husband had both recently lost their jobs. She posted online that she was not going to be able to make it to her daughter's graduation. Hayes encouraged her to send a message to John Simpson and ask for help. To her surprise, John Simpson called her the next day and told her he would give her $300 to pay for gas and a hotel. John Simpson said he gave her $500. "I had so many things going on," she said, "and I was so upset. And I didn't know how I was going to get to my daughter's graduation." Dixon wanted to pay John Simpson back for his help, so she volunteered for the charity. She said she designed the Marines & Mickey logo, designed the charity's website and ran its Facebook page. She participated in conference calls with John Simpson and other members of the charity's board. The group was enthusiastic. They talked about growing their brand, hoping to one day be on par with the Wounded Warrior Project. They talked about buying a shuttered Howard Johnson's near Parris Island for about $3 million, which would provide affordable lodging for families of Marines, plus a cafe and free activities on the water with jet skis and canoes. They also talked about opening a thrift store and a barbershop, with proceeds going to the charity. They told Dixon to tweet messages to Ellen DeGeneres, hoping she would feature the charity on her talk show. Dixon remembers Wynonna Judd responding to a tweets from the Marines & Mickey account. "They were so excited," she said. "This was a celebrity who could help us." The tweet didn't raise the charity's profile. Still, Dixon said, thousands of dollars flooded in because of constant promotion within the private Facebook pages. People like Hayes were passionate about Marines & Mickey, telling others about how much it meant to mothers like Dixon. They said John Simpson motivated them to raise money. "Keep on mission," he wrote in a text message to Chelle Foster, of Long Beach, Calif.
"Get to 6 k by end of week." "Now y'all need to break the record and get to 15 k"
Soon, though, Dixon became concerned. The charity's terms and conditions for parents looking for financial assistance raised red flags. After graduation, where parents and their Marines were expected to pose for a picture that read "Thank you Marines & Mickey," the Marine had to call the foundation within 48 hours. A board member would then pitch the charity to the Marines, encouraging them to "pay it forward" and donate to the charity. They would also be given the option to sign up for monthly automatic withdrawals. "One thing Marines are used to besides fighting is rules," the terms and conditions read. "You need rules for an orderly Corps and society." Hayes, meanwhile, had also soured on John Simpson. She said she helped groups raise about $3,000 for the charity, only to see two or three families sent to graduation, each receiving a couple of hundred dollars. In September 2014, John Simpson told her he was going to pay for her son, a Parris Island drill instructor, to go to Disney World. Hayes was confused. Her son wasn't in need, and he wasn't interested in the trip. Hayes told John Simpson this was a waste of money. She also said she wasn't going to promote his charity anymore. She said he threatened to sue her, name dropping an attorney in Virginia. "Of course," she said, "I never heard back from him." Rachel Roberts, a taxi driver in Jacksonville, N.C., near Marine Corps Base Camp Lejeune, said she began hearing questions about John Simpson from Marines who claimed he was taking excessive automatic withdrawals out of their bank accounts. If they promised to give $50 per month, she said, Simpson took $200. She said she helped 23 Marines close their debit cards and listened while they talked to John Simpson on speaker phone in her taxi. She said he would tell them some sort of mistake had happened during the bank transaction, but they should continue to support the cause. "We stand for each other," she said of how John Simpson pitched the charity. "We're family. The whole b******* propaganda. They're 18-, 19-year-old kids. He says he's a master sergeant. They're trained to respect authority." John Simpson said Roberts and Dixon have both attacked him hoping to get paid, believing he wold beg them to stay quiet, regardless of whether their claims were true. He added that another board member had been the one asking Marines to donate. It was a mistake. "I cut all of that s*** off," he said. "I never let a Marine donate money." In September 2014, Hayes and Dixon reported John Simpson to criminal investigators at the Marine Corps Recruit Depot, Parris Island, saying John Simpson was not using money for his charity properly. Two months later, Public Affairs Director Capt. Gregory Carroll told the Times Free Press, the Inspector General's Office told Marines & Mickey that the office had been informed that the charity might be "engaging in inappropriate business practices." Members of the charity continued to show up to Parris Island without approval, Carroll said. Last December, Armed Forces Disciplinary Control Board placed the charity on an official "off-limits" status. That remains in effect. "It crushed me so bad," Dixon said. "I thought I was doing something so good. To this day, it makes my blood boil. It's not because I want to get paid (for volunteering with Marines & Mickey). It's because of how many people he took advantage of." About one year after Dixon reported the charity to Parris Island officials, John Simpson met Cathy Wells. Almost immediately, Cathy Wells and John Simpson bonded. They talked everyday. John said he told her that his late mother had the same first name as her. He said she had been a school bus driver, like her. He told her he loved her, and they planned to take a trip to Disney World together this summer, just like she and her son would have. Cathy Wells' friends were also charmed. Here was a decorated Marine, dedicating several hours every week to a stranger who tragically lost her son. "He was just somebody that you just wanted to wholeheartedly believe in," said Dina Johnson, who became Marines & Mickey's Cobb County, Ga., event coordinator. "I thought he himself was a hero." Johnson helped organize fundraisers. There was a concert, a Jeep run and a trivia night. John Simpson encouraged Cathy Wells and her friends, telling them they honored Skip Wells by helping families in need. Some people close to Cathy Wells, however, were concerned. Jason Weeks, a retired Marine who served in Desert Storm and lived down the street in Marietta, Ga., said his instincts told him not to trust John Simpson. A former lance corporal with a gruff voice who puts gunpowder on his cereal, Weeks said John Simpson never looked him in the eyes when they talked about the Corps. Then, one day in February, Weeks received a Facebook message from an old friend. 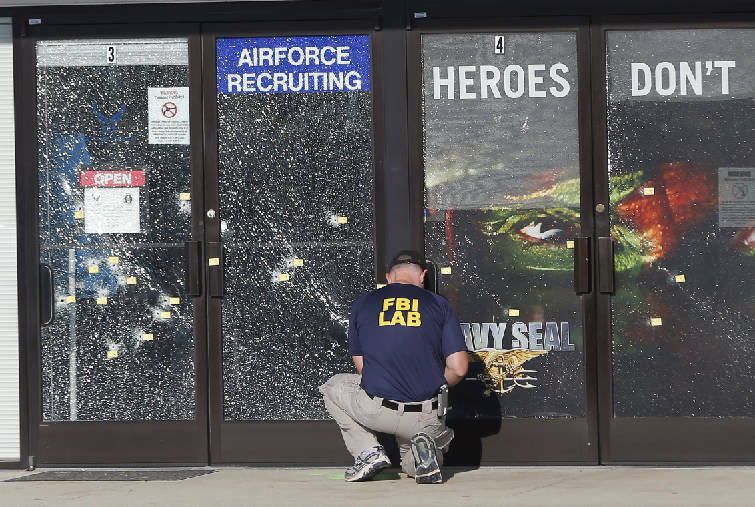 Grice, the South Carolina gym owner, asked Weeks if he could use his Marine connections to look up somebody's military record. The two men knew each other through mixed martial arts competitions in Atlanta, where Weeks serves as a chiropractor and Grice a referee. "It was totally random," Weeks would later say. Grice told Weeks he suspected an old acquaintance of stolen valor, a federal offense in which somebody profits off a lie about their military record. He sent Weeks a link to a Facebook page. It was John Simpson's. "Holy s***, dude," Weeks replied. He called a source in the Corps, who typed the name into a database. That's when Weeks learned about John Simpson's record, about the court martial and the involuntary discharge. If he wasn't being honest about his military record, Weeks figured, his charity, too, was in question. He drove to Cathy Wells' house to give her the news. She was in the kitchen. "I was in the process of making dinner," she said. "Mashing potatoes. And I continued mashing the potatoes. I was mad." Cathy Wells and her friends then concocted a plan. They told John Simpson to meet them in a restaurant in the Atlanta area. A donor had stepped forward, wanting to honor Skip Wells, and they wanted to give John Simpson about $10,000. At the restaurant, Weeks confronted him. He said he knew John Simpson's record was a fraud, and they wanted the money back that they had helped raise. John Simpson declined, Weeks said, and left. He has a different version of events. He said Weeks and a friend became jealous of the success of Marines & Mickey and wanted to take over the charity. They also wanted his money. When John Simpson refused, they made up lies to soil his reputation. "If I let them blackmail me and extort money from the bank," he said earlier this week, "none of this would have come up. God bless them. They're trying." He said he wants to press criminal charges and sue a slew of people for defamation. But people continue to accuse him of fraud, and he wants to wait for the case to die down. Then, he said, he can coolly figure out who needs a lawsuit. He declined to address questions about his military record with the Times Free Press. An archived version of his charity's website said Marines & Mickey was started by "John Simpson, a Retired Marine who was a Recon Marine." Days after his confrontation with Weeks, he posted a statement on the Marines & Mickey website: "As far as Stolen Valor, I never said I was a Force Recon Marine." In an article in the Anderson, S.C. Independent-Mail in March, he is quoted saying that he was, in fact, a Recon Marine. Now, John Simpson says he never gave that interview. Asked about the initial description of him as a Recon Marine on the charity's website, he said another board member posted that. Asked about his official record in the Marines Manpower and Reserve Affairs Department, John Simpson said it didn't make any sense; he didn't know such a department even existed. In March, a spokesperson for the Naval Criminal Investigative Service, a federal law enforcement agency, confirmed they are examining claims against John Simpson. Weeks and Cathy Wells have also both said they have spoken with the FBI about John Simpson. Weeks said John Simpson gained about $160,000 off the memory of Skip Wells. That includes money Cathy Wells helped raise for Marines & Mickey, as well as $25,000 that football great Peyton Manning gave John Simpson from the Chattanooga Heroes Fund — at the request of Cathy Wells. The total amount of money also includes a $75,000 loan, which Weeks said Cathy Wells gave to John Simpson late last year. John Simpson denies that he ever received donations near this amount. At most, he said, he received $70,000. And the money went toward his mission: Sending Marines to Disney World. He said he has sent 37 families to the theme park, including three this year. Another family is going next month. He provided the Times Free Press with six names and phone numbers of people who benefited from the charity. Of those, five responded to calls seeking comment this week. Two said they received checks from John Simpson, covering their costs for the trip. Two said they never received any benefits. Another one, Staff Sgt. Daniel Franklin, said John Simpson paid for his family of four's hotel stay in Orlando in April. But, Franklin said, money for the actual tickets to Disney World never materialized. He said he contacted John Simpson but didn't hear back. Franklin, who had served as Skip Wells' recruiter, said he already suspected the trip might fall through. His family paid their own way into the theme park. He then said he contacted the NCIS, telling them John Simpson hadn't given him everything he promised. John Simpson said all of the money his charity received went to its cause. He even put thousands of his own dollars in. According to a 2014 990 for the charity that Simpson provided to the Times Free Press, all but $286 of the $96,166 raised that year went to families of Marines. None of the money went to salaries, according to the 990. In a divorce filing earlier this year, however, John Simpson wrote that he makes $3,800 a month as president of Marines & Mickey. When Cathy Wells announced in February that she was separating herself from John Simpson's charity, news spread online through the community of Marine parents. Hayes said she felt guilty for not warning Cathy Wells sooner. "She was trying to do something good in her son's name," Hayes said. "But there was a monster out there, just waiting. Just waiting to get her money." She added: "All of this is coming out now because of Skip. It's like there's nothing good about a death. But because of what happened to him, this organization is going to be stopped from scamming trusting, innocent people who just want to see their child graduate from boot camp." John Simpson's father said last month he believes his son's heart is in the right place. He may have misstepped slightly and is now paying a big price. "He's not a con artist," John C. Simpson said. "He just wanted to help people. The worst thing he did was lie about his military record, apparently. If he hadn't done that, he'd still be running the charity." Someone still is running the charity, apparently. Last month, the mother of a Marine said her son's card got denied when he tried to pay for a haircut. He called the bank, she said, where an employee explained that the company had frozen his account after Marines & Mickey tried five times to charge his account. The Marine's mother, Melissa Valdez Retana, was furious. She said she had received about $100 from Marines & Mickey to send her to boot camp graduation in 2015. She encouraged her son to donate, to pay it forward. He agreed to donate one time. Retana, who lives in Arizona, said she called the charity and left a message. She later received a voicemail. "Hey this is Justin with the Marines & Mickey Foundation. Got your message. Sent you a text. Systems were hacked, and three cards were charged. We are getting that rectified now, and everything should be reversed and squared away in the next few days." The call and a text message came from John Simpson's phone number. But he said his charity hasn't accepted donations for months. Its bank accounts are closed. He also said he has never heard of Retana. On June 8, when the messages came through, he said he didn't have his phone. He said he gave it to Justin Keown, Marines & Mickey's vice president. Keown said that is not true. He quit the charity months ago and hasn't talked to John Simpson since January.